I am currently completing my Divemaster Internship in Gran Canaria. At the moment I am just about finished my Divemaster course but I am unsure of the medical facilities around me and what to ask for at these Spanish facilities. My instructor has advised me to contact you as he also doesn´t know the Spanish equivalent of the medical. It would be much appreciated if you could enlighten both of us as it would solve a big problem for me. Thank you for your time. This is easy mate. When you do the DM internship, or DMT as it’s known, there is the basic PADI medical proforma in the pack. That needs to be done by a doc at some point along your DMT. Most divers seem to arrive at my door for this at the end of their course, the logic being that if they’re gonna flunk it for non-medical reasons, then at least they realise this before coughing up for the doc’s fees for the medical. 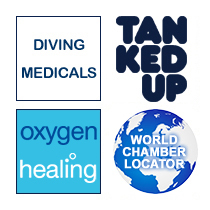 However most divers have no problems, either diving or medical and can get this part of the form done by a normal GP, or a dive doc. So if you are in Spain simply take this form to a local GP and get the basic medical and all should be fine. However, if you tick a yes to any part of the medical questions, e.g. you are on regular meds, have had a bend, are asthmatic etc, then it’s best to see a dive doc on the island, or have seen one before going there in the first place. That’s the Euro and rest of the world rules. It’s different over here in the UK though. Here a DMT needs to have the full on commercial diving medical. It’s known as the HSE medical, is more thorough and more expensive to have. That is because Blighty rules are that a DMT has responsibility over live divers and so is seen as commercial. This rule also applies to DM’s arriving in the UK who have qualified abroad and who are looking to do DM work over here. Simple really. So answer all NO’s on the form, see any doc there. Any YES’s and it’s a dive doc you need. And if you come back here, get the HSE to supplement it.